Amanda Hanley advises on creating a sanctuary that brings together luxury, comfort and beauty, using creativity, careful planning and indulgent details. As the master bedroom is rarely seen by guests, it can often fall low on the priority list. However, as we spend an estimated third of our lives in our bedroom, it’s well worth investing time and effort in. The bedroom is a space for rest and relaxation, but should also be highly functional, providing storage for clothing, shoes and personal items. Of course, the main focus for any bedroom is the bed. A comfortable bed should be one of our most important home buys. Before you purchase, consider the size and shape of the room, as well as architectural features, such as the position of windows, doors and recesses. Think about your options for positioning it, perhaps by drawing up a floorplan, then select the most generous one you can fit, whilst sensibly allowing room to walk around and accommodate other furniture. Embrace grand and dramatic. Making a feature of your bed will make the room feel luxurious and inviting. 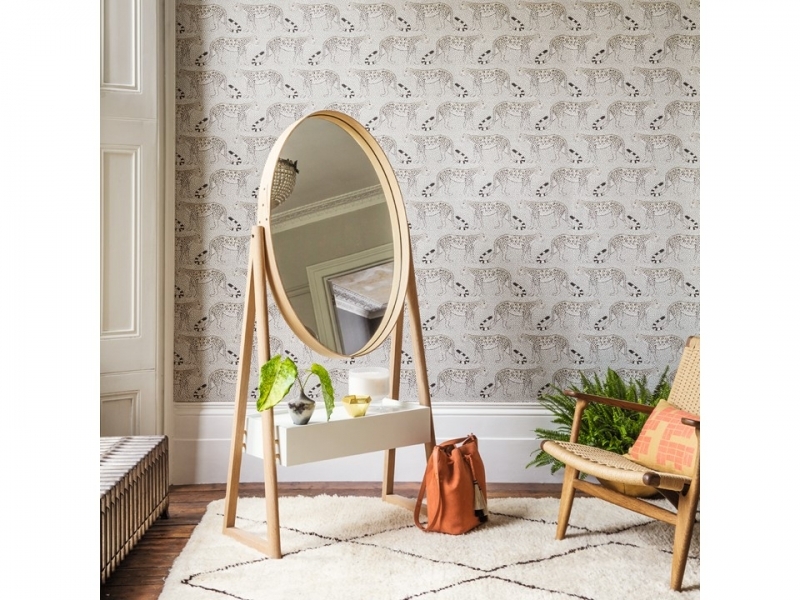 A four-poster adds instant impact, but if this is too imposing for your room, there are many alternatives to give that wow factor. You could try a decadent canopy, a large and beautifully upholstered headboard (which can really set the tone of the room and make it feel bigger), or even a fabric panel behind the headboard for a layered and cosy look. All of these options create height, and bring fabrics into the room, adding colour, pattern, depth and interest. Once you have chosen your bed, you can start to think about furniture. Wardrobes need to be positioned to utilise space for storage in the best way possible. The design should enhance the scheme, as well as suit your lifestyle and the type of clothes you wear. For a lighter look, choose wardrobes elevated on feet. Finding the perfect bedside table can be a challenge – the scale needs to work with the bed and the room itself. Symmetry is the most conventional way to go, but two different antique pieces can work well too, as long as they are close to the same height. Most importantly, make sure your bedside furniture is big enough to hold what you need close to your bed. 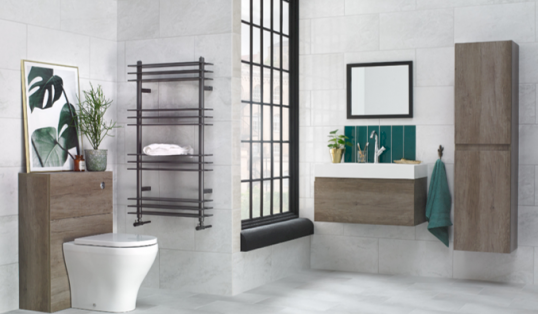 If you have the space for it, occasional furniture, such as a pretty chair, an upholstered bench seat at the foot of the bed, window seating, or even a chaise lounge, all add extra character and functionality and make the room multifunctional. Restful and serene doesn’t mean it needs to be plain. Soft, pretty and romantic patterns work particularly well – think florals, trailing leaf prints, and glamorous damasks to create a relaxing ambience. Often people make the mistake of choosing small patterns because they are afraid a large pattern will be overwhelming, when actually large patterns can feel soothing, because they aren’t as ‘busy’ as smaller, ditsy designs. Soft pastels are gentle, feminine and tranquil, however, deeper tones can be cocooning and look beautiful in the evening light. 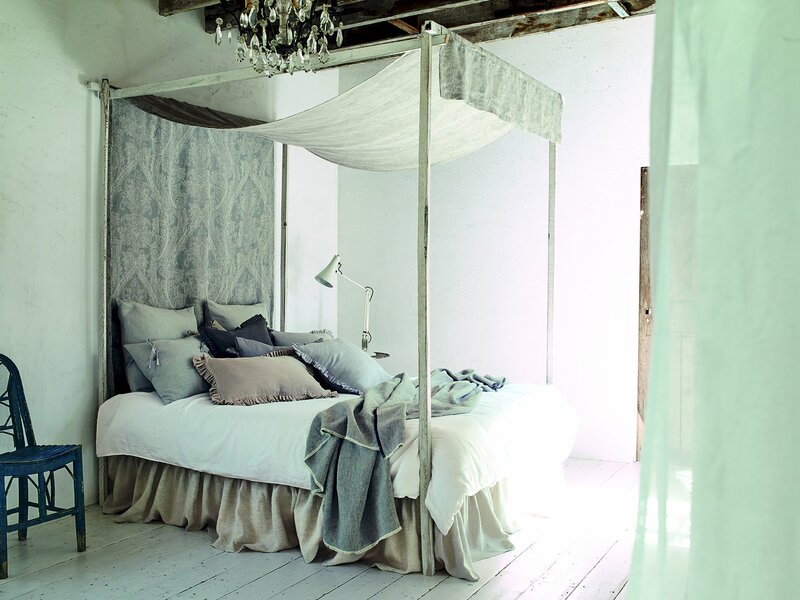 Your bedroom is your own private space, so indulge yourself in your own fantasies. A bedroom should be something that captures the imagination, and is a great space to experiment with textiles and patterns. For a luxurious and unique look, fabric walling adds a wonderfully warm extra layer and cuts down on sound – it is also a clever idea if walls are uneven, and wallpaper may emphasise defects. Choosing the right window treatment can make for a much better night’s sleep. If you are sensitive to light, blackout lining is a great option. 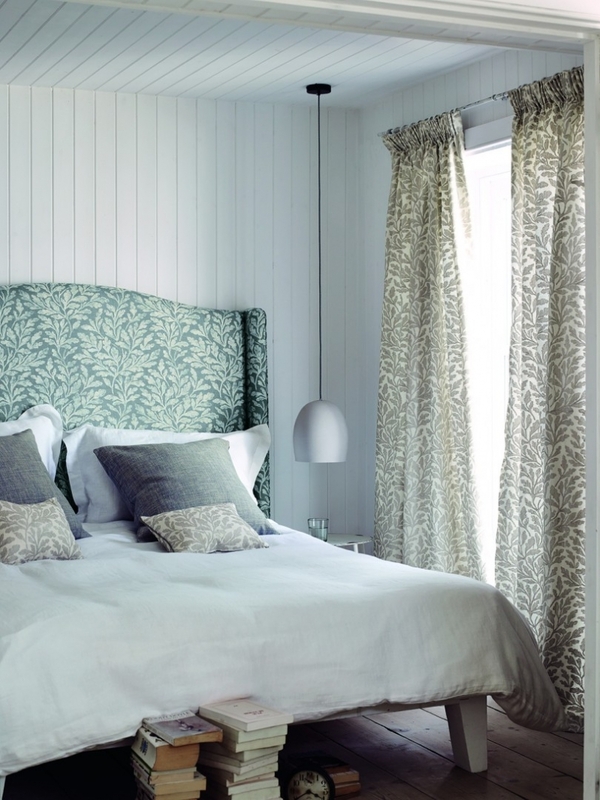 If your room is draughty, go for insulating interlined curtains. 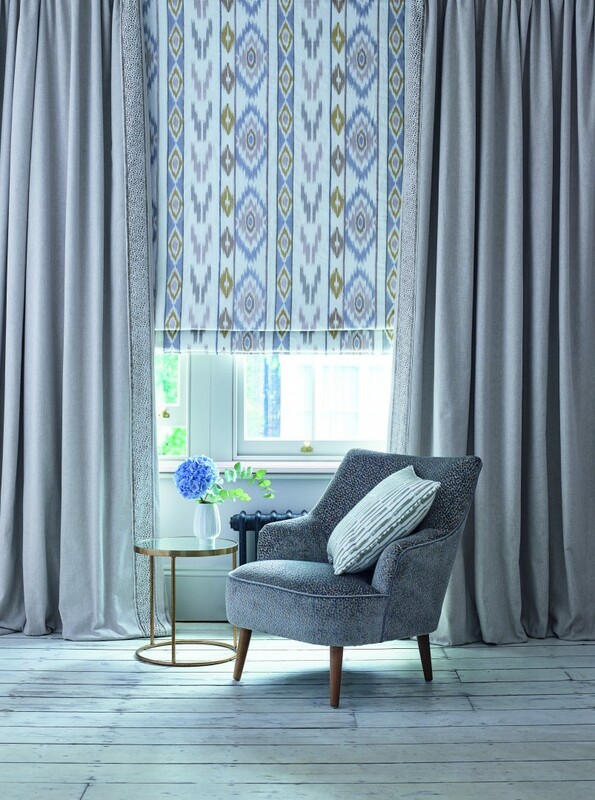 A combination of window treatments, such as a roman or roller blind, combined with full-length interlined curtains make the room much more adaptable for use in the day. Have some fun with trims and embellishments that add detail and personality. Reading and relaxing in bed is one of life’s pleasures, so make it a priority early on. 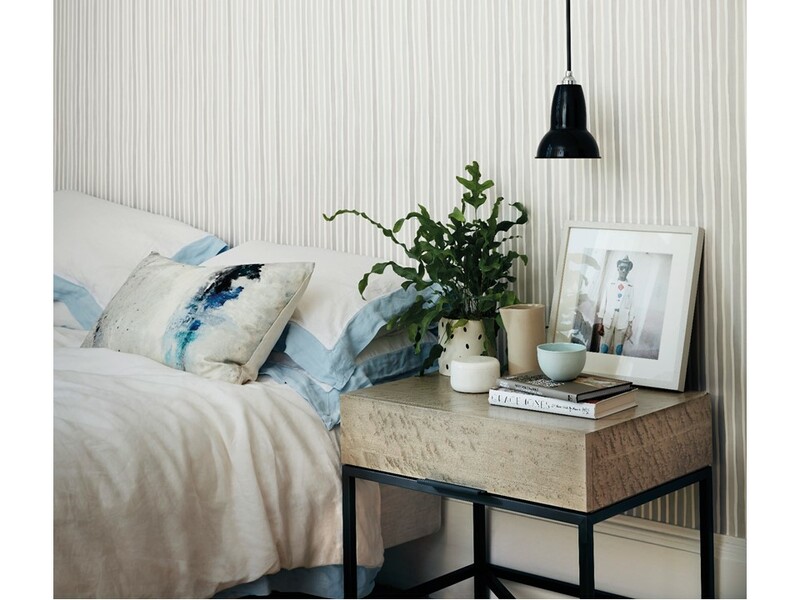 Your choice of bedside lighting will depend on the height of your bedside table; a low table enables a taller feature lamp and a tall table requires a lower lamp, to provide light at the correct level for reading in bed. However, bedside lighting does not need to be limited to lamps. If your space is small, wall lights either side of the bed are a particularly good option – it sounds obvious, but make sure that switches are well located. Pendants hung from the ceiling can also look extremely striking and modern. In addition to bedside lighting, ceiling pendants elsewhere in the room can add glamour to a scheme. Fit a dimmer switch to give full light when you need it, and lower light for rest. Fresh or silk flowers make a room feel welcoming. Cushions, bed throws and rugs add extra colour, texture and comfort to your scheme. Carefully chosen artwork creates an impact and atmosphere. Mirrors reflect light and make a room feel larger. A few favourite personal objects and photographs will create the perfect retreat. 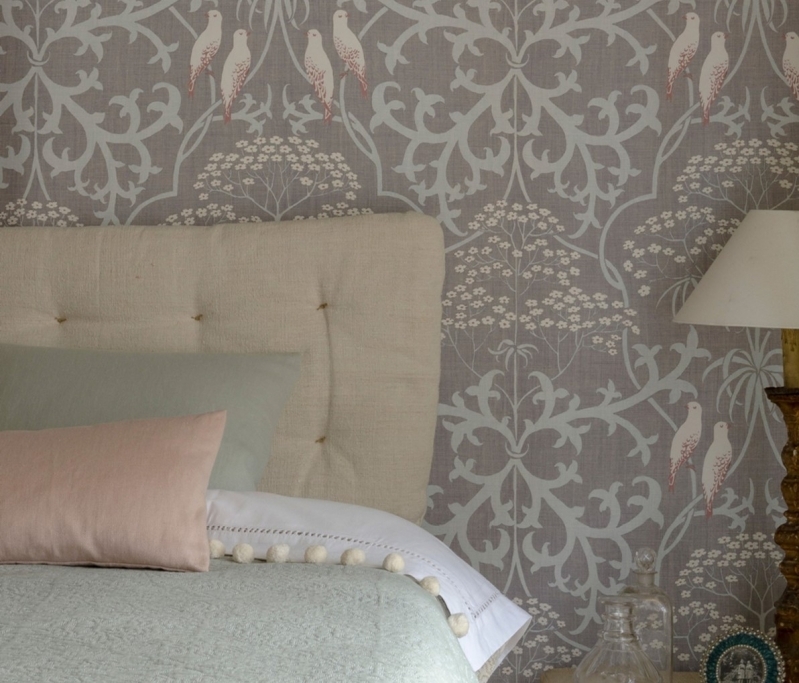 Plain fabric often forms the backbone of decorating schemes, offering both subtle colour and texture. 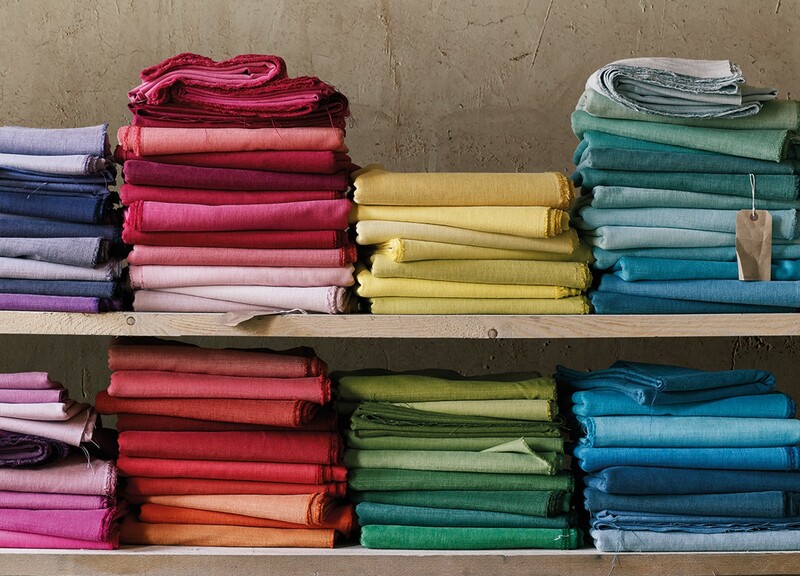 A firm favourite of mine is Romo’s “Linara”, a cotton-linen blend, available in an amazing range of over 360 shades. It has a beautiful brushed finish that feels exceptionally soft to the touch.